Our friends at the Asbestos Disease Awareness Organization are going to be posting some fantastic content this week and we thought you might like to have a heads-up. "Knowing how to prevent asbestos exposure saves lives!" We agree! Tuesday, April 1, ADAO will be reporting on the fact that asbestos is not banned in the United States. “Asbestos: Legal and Lethal in the USA.” ADAO Co-Founder Linda Reinstein will share information about asbestos mining, manufacturing, and commerce. Wednesday, April 2: “Asbestos: What Is It?” ADAO Scientific Advisory Board Co-Chair Dr. Richard Lemen xplains where asbestos is found and who might be in danger of being exposed. There are many professions which bring an increased risk of asbestos exposure. Thursday, April 3: “Why Is Asbestos Bad for My Health?” ADAO Scientific Advisory Board Co-Chair Dr. Arthur Frank will explain what you should do if you are diagnosed with an asbestos-related disease. Friday, April 4: Asbestos-related diseases are not inevitable. In his “Toolkit for the Elimination of Asbestos-Related Diseases (ARDs),” esteemed scientist and Acting Director of the WHO Collaborating Centre for Occupational Health in Japan Dr. Ken Takahashi gives us an informational toolkit for tackling ARDs. On Saturday, April 5, the ADAO will be telling some personal stories of living with Mesothelioma, the cancer caused by exposure to asbestos. Sunday, April 6: Statements from the US government: U.S. Surgeons General Statements and Senate Resolution 336. 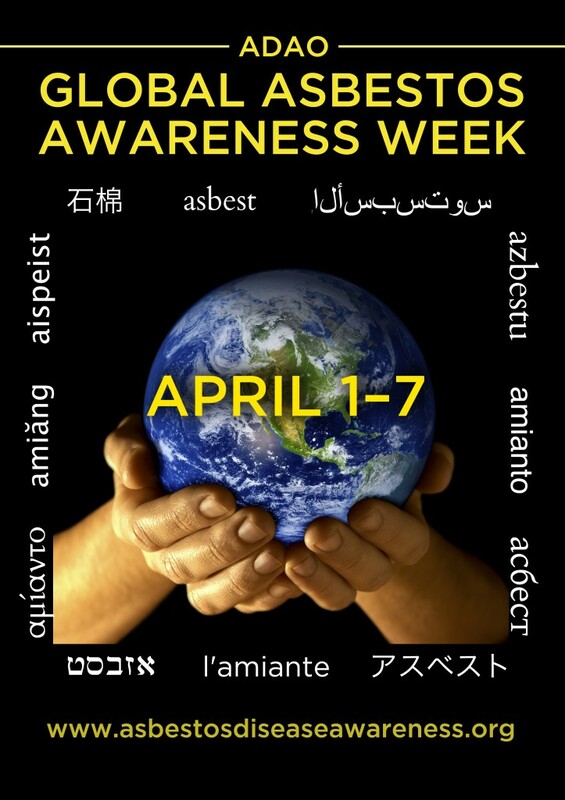 Monday, April 7: ADAO will end Global Asbestos Awareness Week with a Candlelight Vigil to honor and remember those sickened by preventable asbestos-caused diseases. We will join them. What is the most important thing to know about Asbestos in 2014? There is no safe level of exposure to asbestos. If you have asbestos-containing materials in your home, you probably want to remove it, but it is not safe to do it yourself. Make sure you get professional advice and assistance. Asbestos abatement professionals know how to protect themselves from exposure as well as how to remove asbestos without contaminating your home or your neighborhood any further. In California, contact Alliance Environmental Group for help removing asbestos including popcorn ceilings, linoleum, pipe and other insulation and any other asbestos building or decorating materials.